Are you faster than a quantum computer? By playing this game you are providing us with data on how the human mind solves highly complex problems with only intuition. We hope to create new and intuitive ways to solve the same problems as state of the art quantum computers. Is the human mind more efficient? This current demo version of the game is not supported on mobile devices. We want to find the best solution to our spin glass problem. To begin try clicking on the most red nodes (which are bad, as indicated by the slider in the bottom left of the screen). 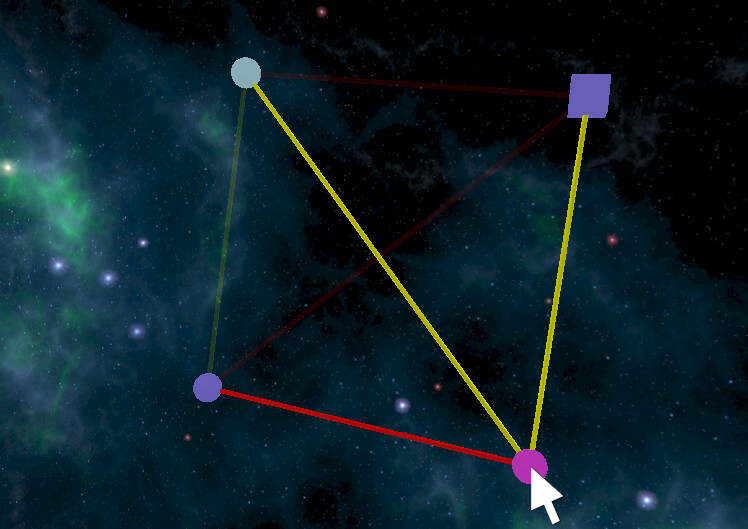 In the first level, for example, try clicking on the top left node. The colour represents the "frustration" of each node. 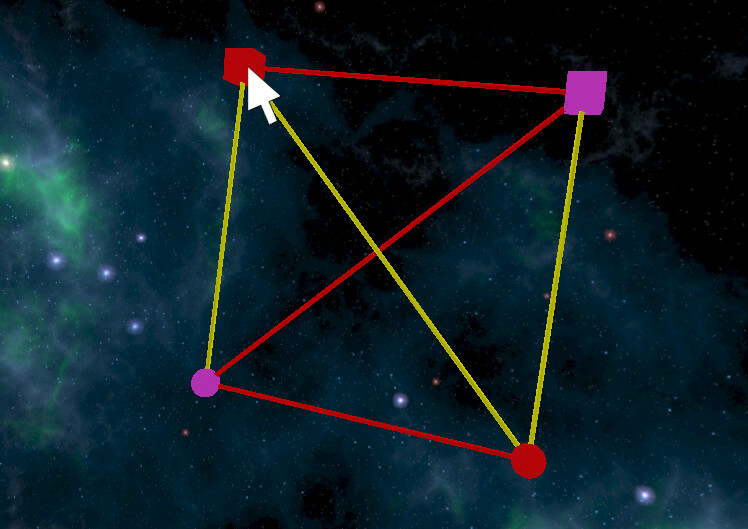 A highly frustrated (red) node corresponds to one that would reduce the total energy of the system if it is flipped. 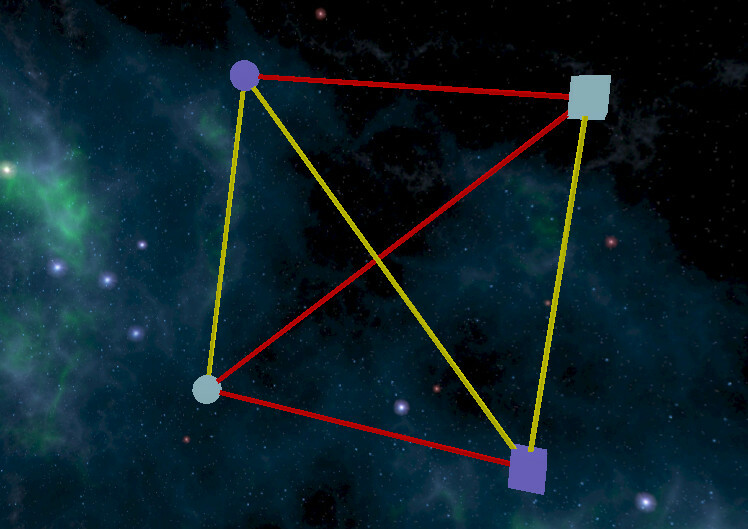 Hint: If you get stuck just cick the nodes which are most red! A yellow connection (or edge) is satisfied when its connecting nodes are the same. That is they are both circles, or they are both squares. A red connection prefers opposite nodes. In our example we can't satisfy all the edges perfectly, but instead we find a "good" solution. This corresponds to finding the minimum energy amongst a highly complex energy landscape. Hint: Rotate the camera by using the right mouse button! Our first example was easy! Each edge contributes a score. We get +5 points for happy edges and -5 points for unhappy edges. Although not every node is perfectly happy, we have found a solution which gives a good score overall. Hint: you won't be able to satisfy every connection perfectly! When you click on a node it will change into a square or a circle. This corresponds to flipping the spin of a particle. 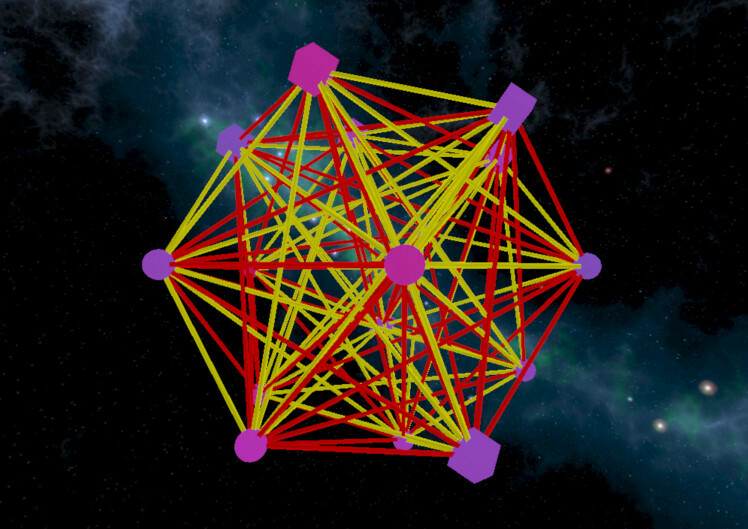 The nodes will become more or less frustrated depending on the colour of all its connections and connected nodes. This is indicated by the colour of the node. Hint: Change the colour plotting function by moving the "Col" slider! The side panel shows your level score, as well as your total score. Each flip of a node takes one point, so use them wisely. 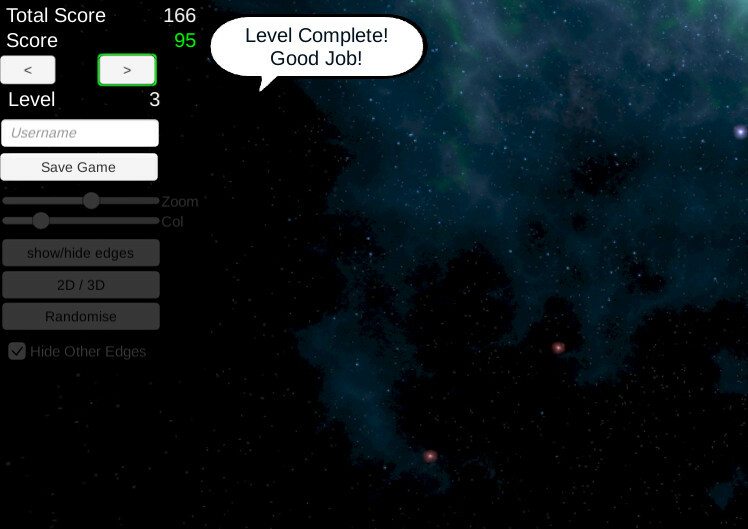 Once you complete a level (when the score turns green) you will get bonus points! Hint: Stuck? 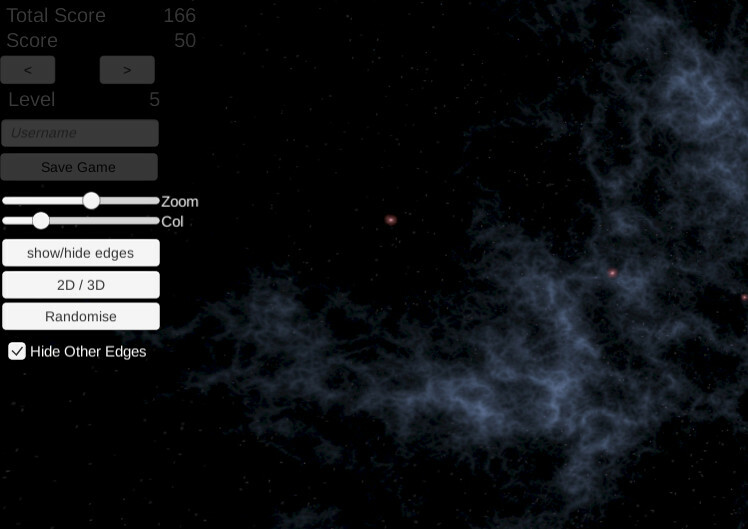 Try randomising the nodes to give yourself a fresh start! This is a demo so feel free to play around with the scale, dimensions and whether or not you can see all the connections. There is also a randomise button to shuffle the nodes. But it will cost you points! Hint: Press 2D/3D to transform the network between dimensions! Netty, in its current form, will only be available for 1 month until the 1st August. After this time all the data will be analysed and the results will be published in August. The grid represents each of the 22 levels of Netty and how many times each one has been completed. For a good, quantitative, data analysis we require many plays! The dark tiles represent levels that have not been solved at all. Can you help to fill all the tiles to green? 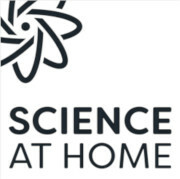 This is a demo project by scientists at the University of Aarhus. Cameron Calcluth, with the support of Professor Jacob Sherson and Dr. Robert Heck. By playing this game, you are essentially minimising the energy of a collection of interacting spins. For example, the spin up and spin down of an electron in a collection of atoms. This is called a spin glass problem and this specific example is the Sherrington-Kirkpatrick model. This is a problem belonging to the class of NP-Hard problems. For a network of 70 spins (level 14), we have more possible ways of configuring the spins than there are stars in the observable universe! Can human intuition help shape the way computers solve these problems? This problem is very similar to the one solved by the DWave quantum computing hardware. In fact, it is even harder! The DWave machine has many less connections between each node. To solve one of these problems on the DWave requires even more nodes. Is the human brain (that includes yours) capable of solving these advanced problems better than state of the art algorithms, physicists and quantum comptuers? By playing Netty you can help answer this question. There will soon be a leaderboard, but for now, discuss your strategies with the community over at Reddit.